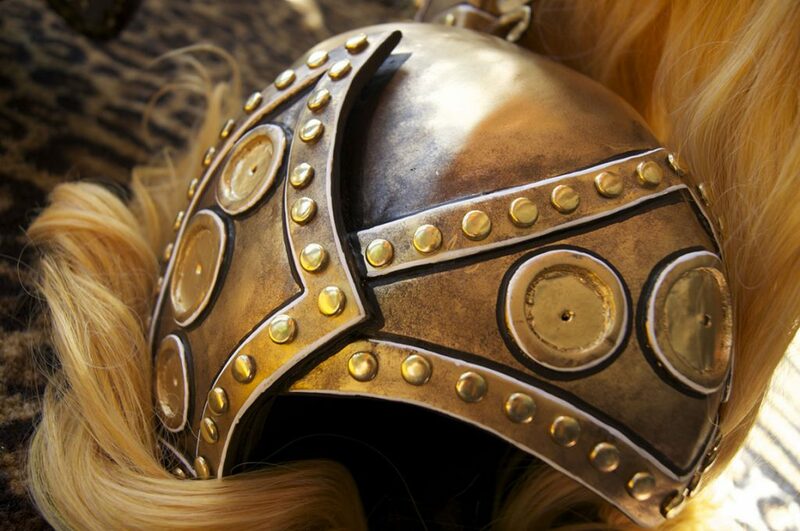 Have you ever wanted to make your own helmet for a costume? 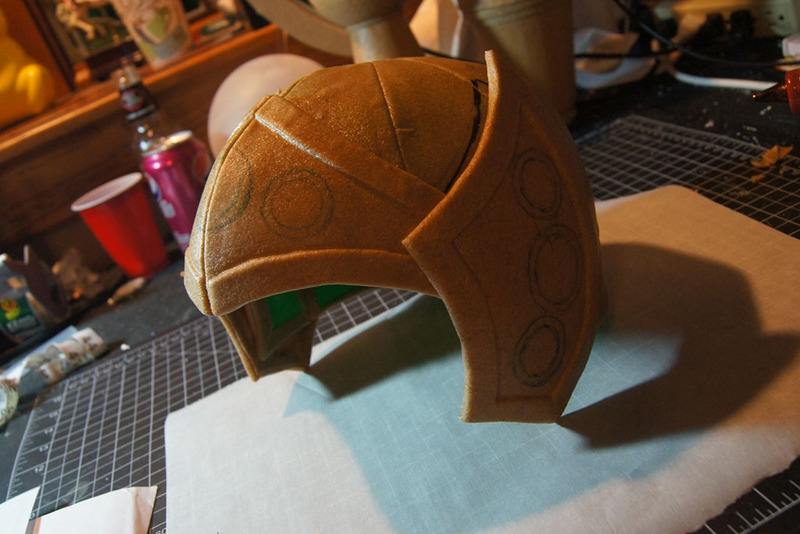 This tutorial by the fantastic Termina Cosplay will show one way to do it! As with most projects, you have to start with a pattern. Making a helmet is no different. 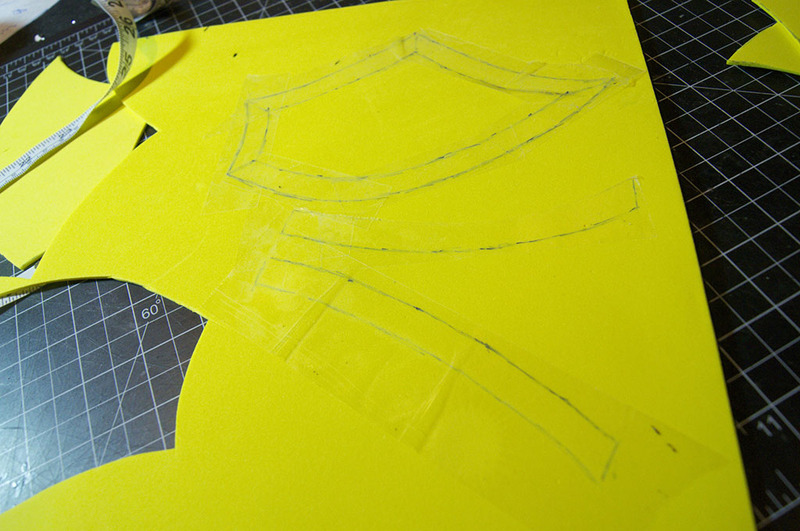 To start, you can get a basic pattern shape by using the plastic wrap and masking tape method. If you wrap your own head, please don’t cover your whole face. You won’t be able to breathe if you cover your whole face. Just cover the areas of your head that you’ll need to fit the helmet. If you’re using a mannequin head, you obviously don’t have to be as careful; make sure your mannequin head is about the same size as your own head or your pattern might not fit you. 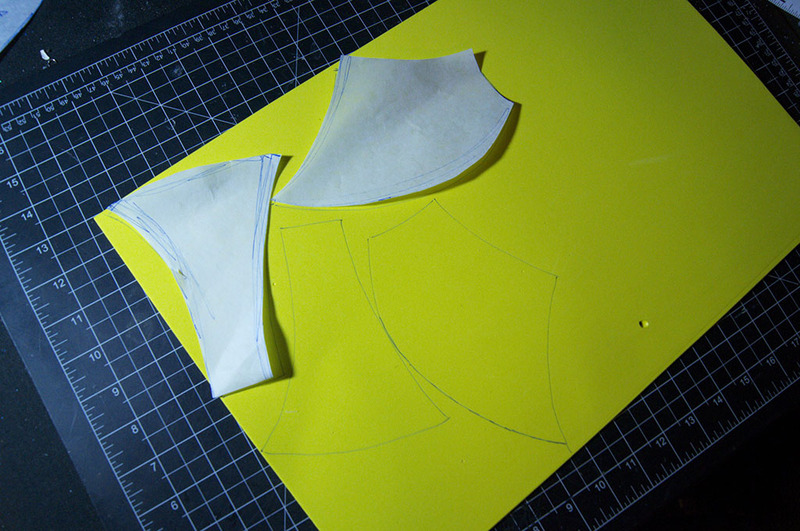 Once you have your basic pattern drawn, cut it out. Now spend some time making sure the helmet pattern you just made looks and fits like you want it to. 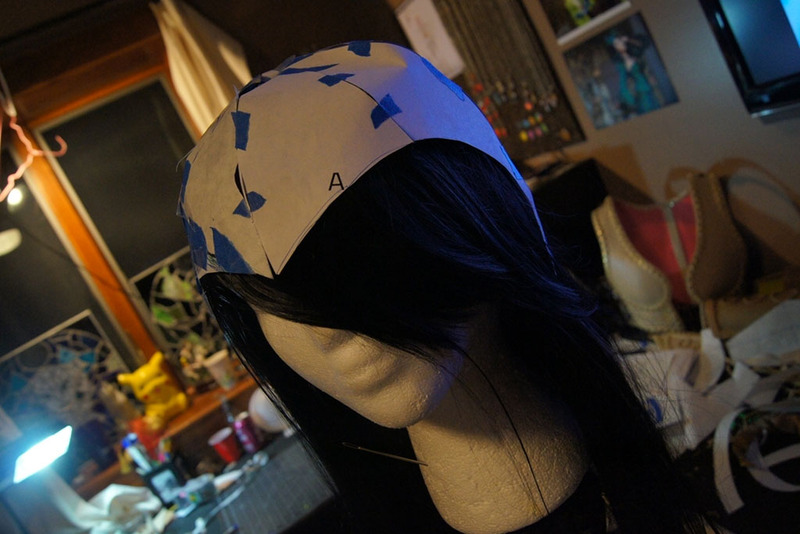 Since there were so many different lines and tape, I changed my pattern drastically from the initial pattern I drew. 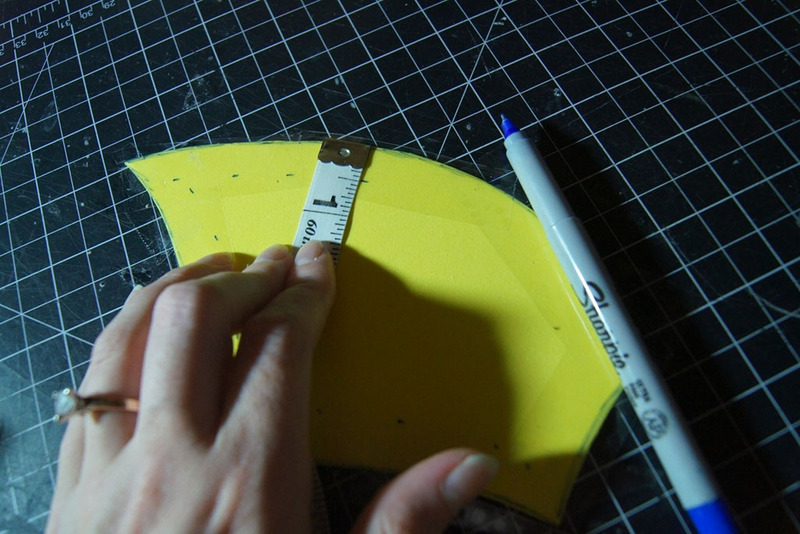 Once you’re happy with the shape and fit, you can transfer all your pattern pieces to new paper to make them look nicer and easier to work with, but this isn’t totally necessary if you don’t want to do it. 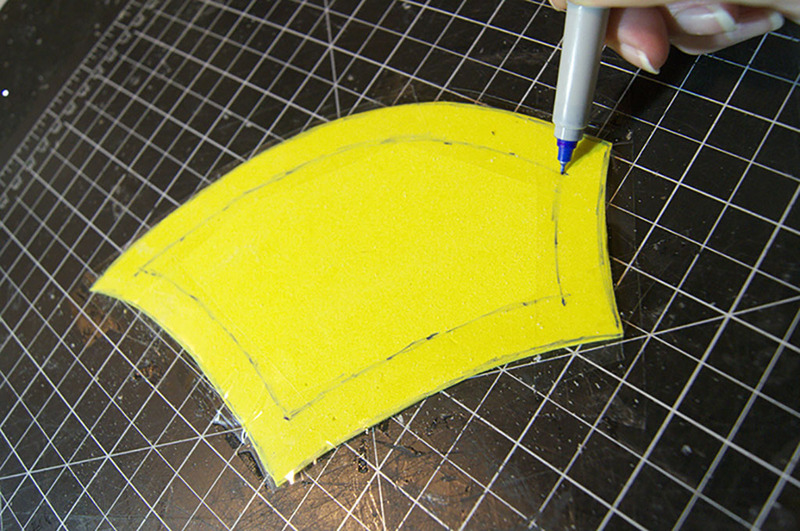 Get a piece of craft foam and transfer your pattern pieces over to it. Helmets are usually symmetrical, so your pieces should be symmetrical, too. 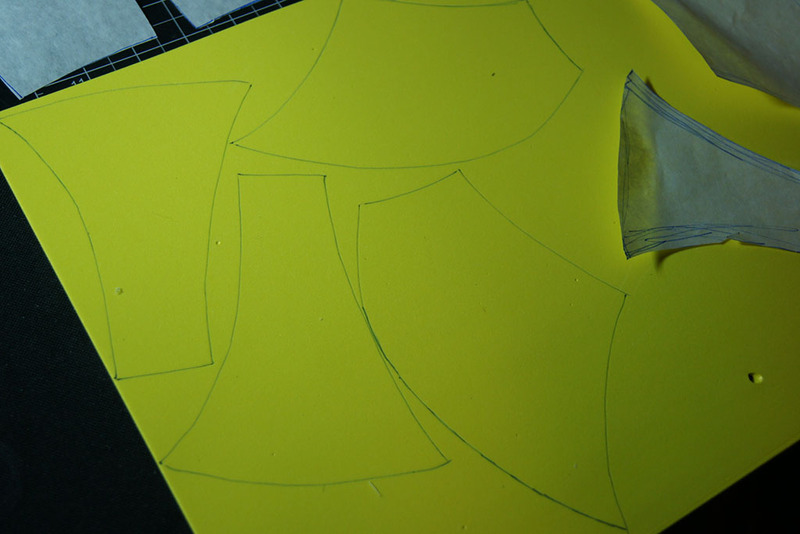 You’ll also need to cut out any details you want to add before covering all your pieces in Worbla, so be sure to do that now as well. 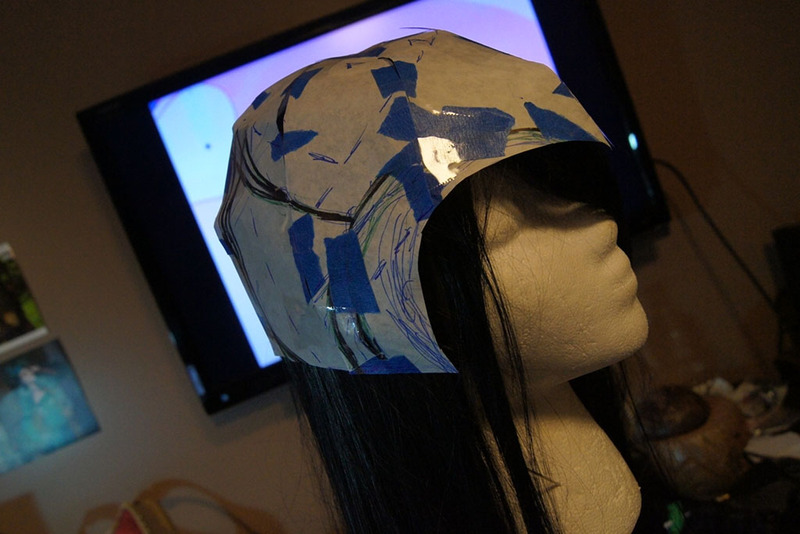 I wanted to add a raised edge to my helmet, so I made the patterns for these raised edges by simply applying packing tape (though masking tape would work just as well) to my helmet pieces and drawing the details onto the tape. It’s hard to see in the photos, but the packing tape is there. I used a measuring tape to mark about a half inch all the way around my pieces, and then connected the dots. Then, I carefully lifted the tape from my foam pieces and stuck them down to a new piece of foam to cut out. 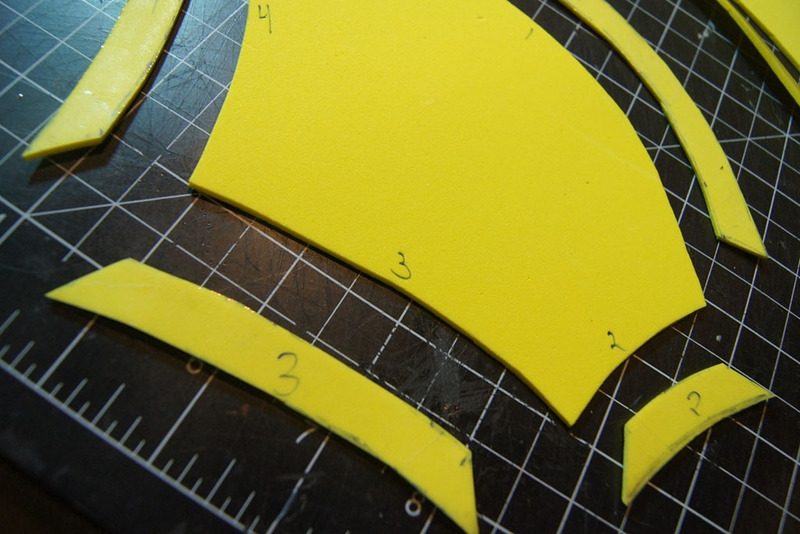 Be sure to mark your detail pieces and your foam pieces so you can put them together easily. I used numbers to mark mine. 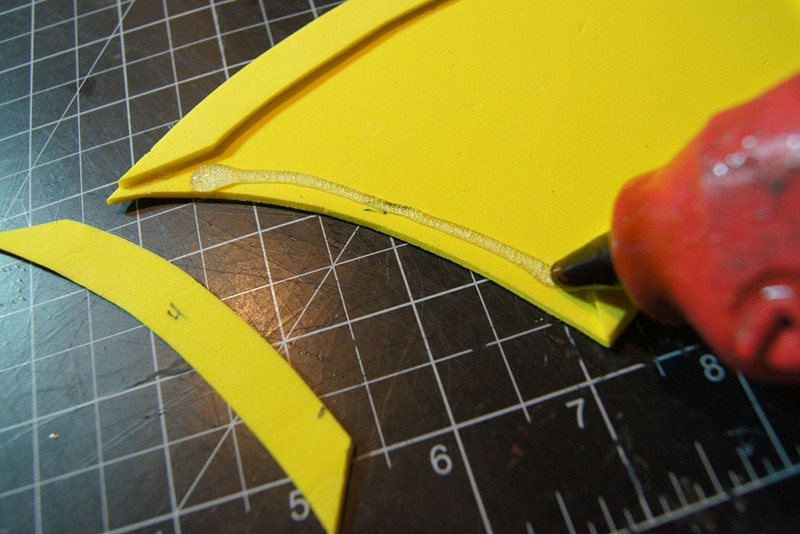 Once you have all your foam pieces cut out, it’s time to glue them. I simply took a glue gun and applied some glue along the edge and then pressed my details down on top to glue them. In no time at all, all my pieces had a nice raised edge. 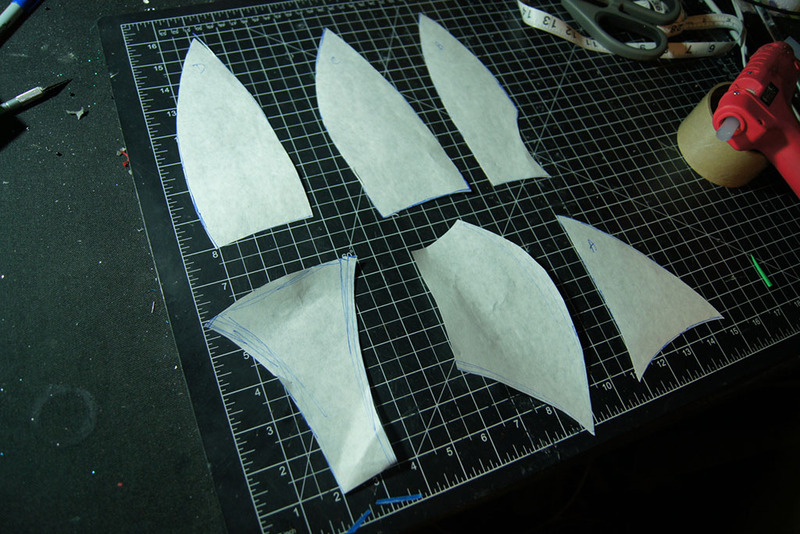 Next you’ll need to cut out a piece of Worbla for each piece of foam you have. 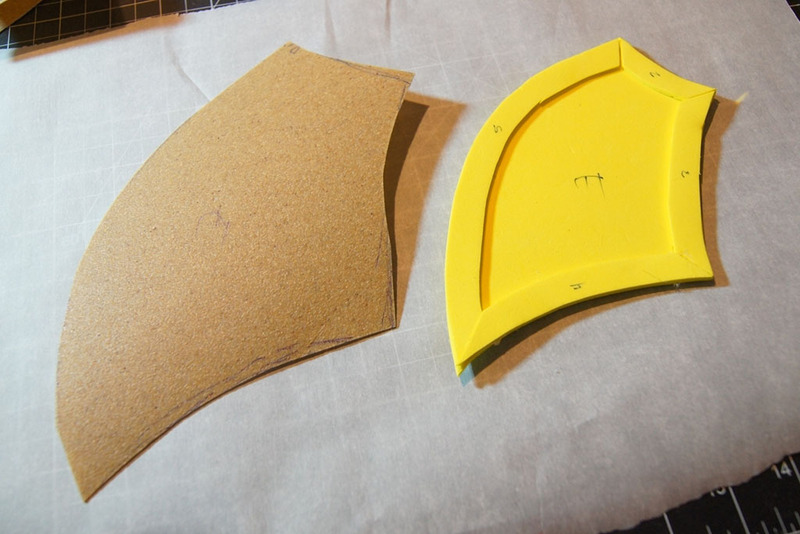 Cut out your Worbla piece a bit bigger than the foam piece. I usually cut mine about a half inch larger all the way around. 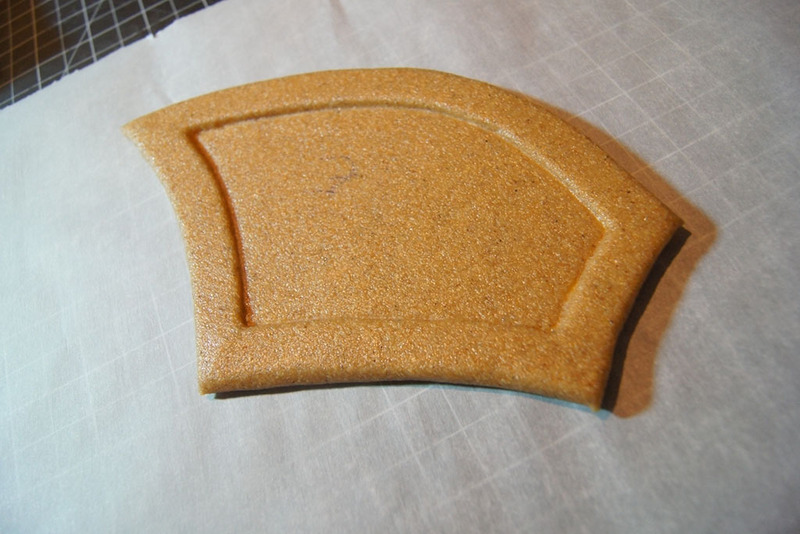 I used Worbla’s Finest Art in this example, but you can also use Worbla’s Black Art, Mesh Art, or really any other thermoplastic sheet to do this. There are advantages and disadvantages to each material. Experimenting with them is the best way to know which one will work best for you! 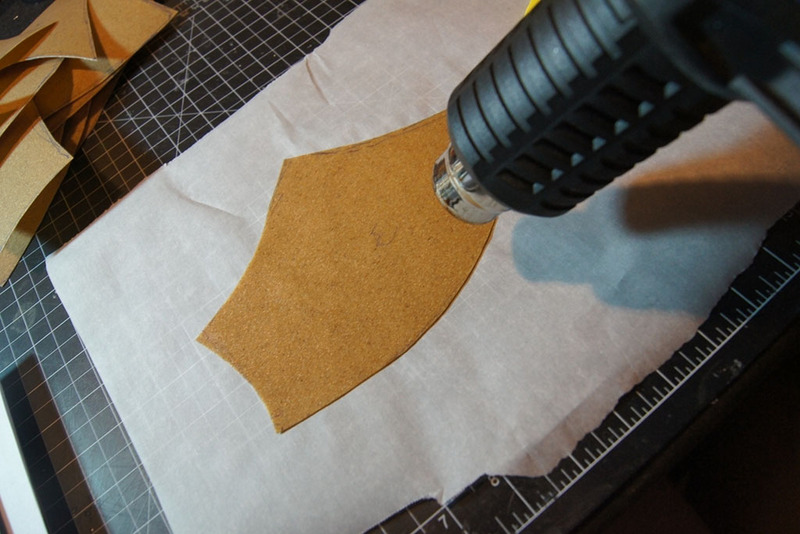 To apply Worbla to foam, all you need to do is heat it up with a heat gun until it is soft and moldable, stick it over the top of your foam, and press it down. 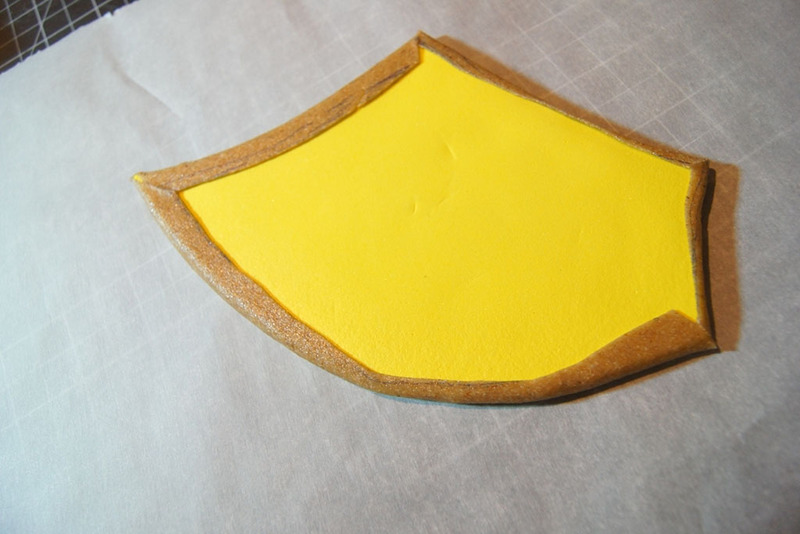 To make the raised edges show up, use a small clay tool, plastic silverware, or a ruler to press the Worbla down into the edges. Once all the details are pressed in, flip the piece over, heat it up again, fold all the edges over to the back of the foam and press it down. 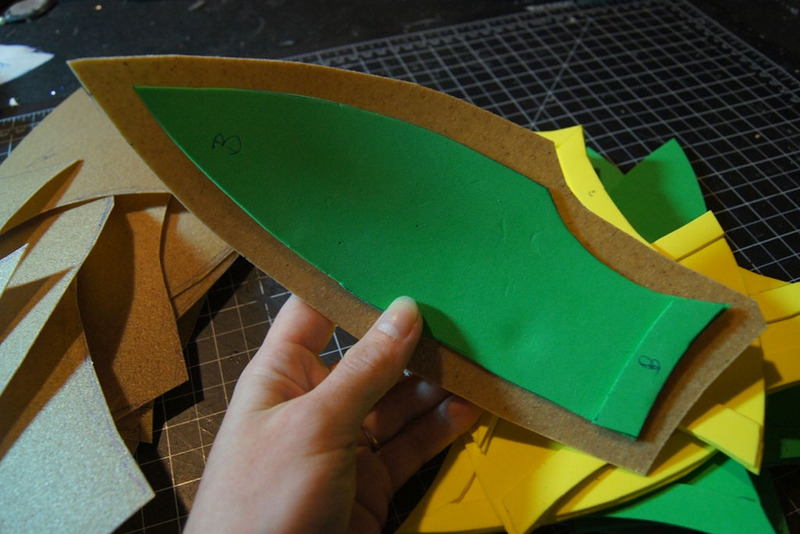 Cut off any extra Worbla with scissors, and you’re done! Now repeat the process for each piece you have. To stick our helmet pieces together, all you have to do is heat them up with the heat gun and stick them together at the edges. 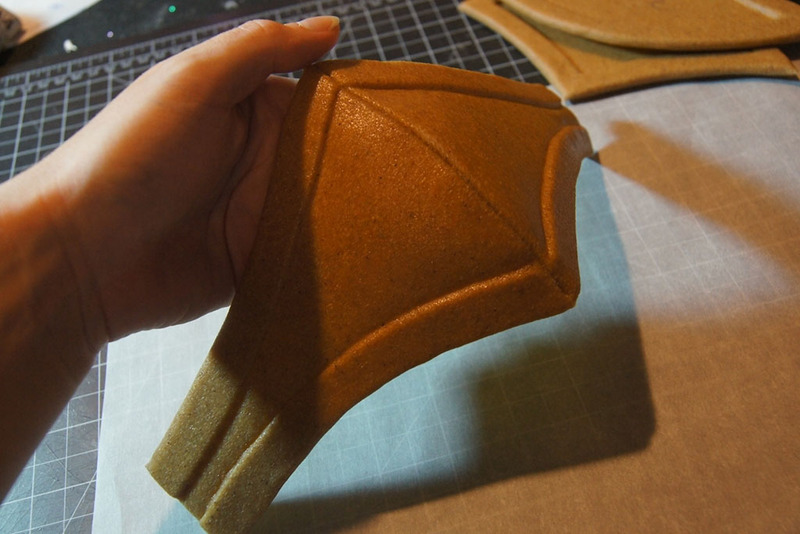 Worbla will stick to itself when warm, so no extra glue is required. While the pieces are warm, you can also shape the pieces to fit your head. So, if your piece needs to curve, make it curve! If you mess up, you can always just reheat the piece and try again. It usually takes some experimentation to get the perfect shape. Once your whole helmet is together, add any extra details you still need. 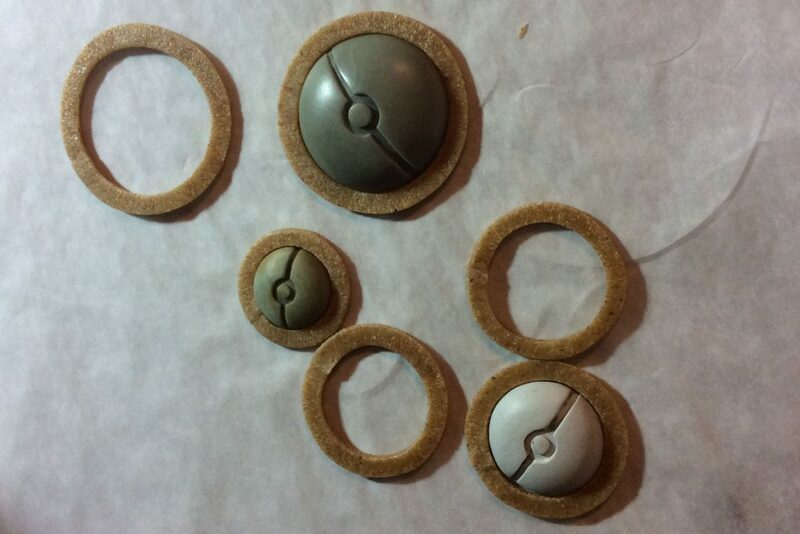 I wanted to add gems to mine, so I added the settings for them by using Worbla Scraps. 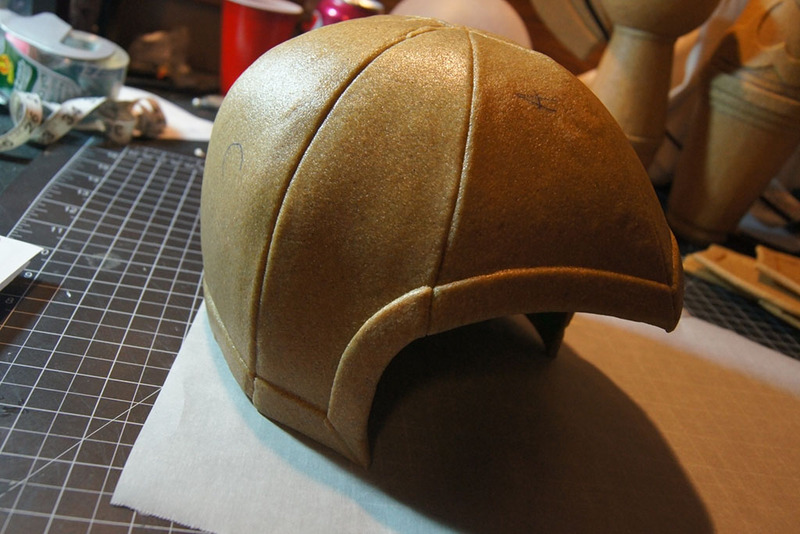 Also take the time to fill in any seams you have from putting together your helmet pieces. You can do this a number of ways, but I did it by filling the seams with scrap Worbla and sanding it smooth with a Dremel. You can also get rid of any air bubbles that got trapped under the Worbla by poking it with a needle and smashing the air out when it’s warm. 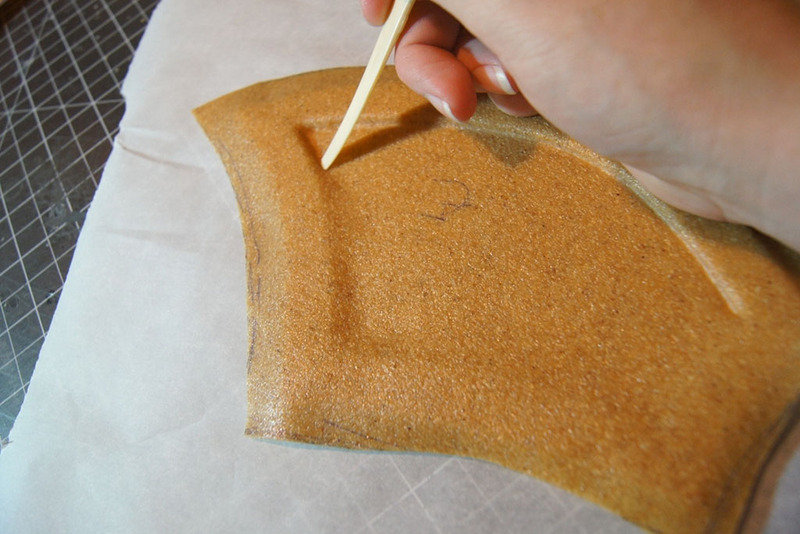 There are many different ways to smooth Worbla. You can use wood glue, gesso, Mod Podge, filler primer, Flexbond, and many other things. My personal way to smooth is to use a dry wall filler on areas that need a lot of love, like seam lines, dents, or other ungodly lumpy areas first. Then I use multiple layers of filler primer for the rest, and sand in between layers. The last step is to paint your helmet. For this particular helmet, I started with a few layers of gold spray paint, then added the shading and weathering with bronze and black acrylic paints. Then I outlined all the low edges with a black paint marker and highlighted the high edges with a white paint marker. If you can, its a good idea to seal the paint with a clear coat. Just be careful, and test your products before you use them on the real thing. 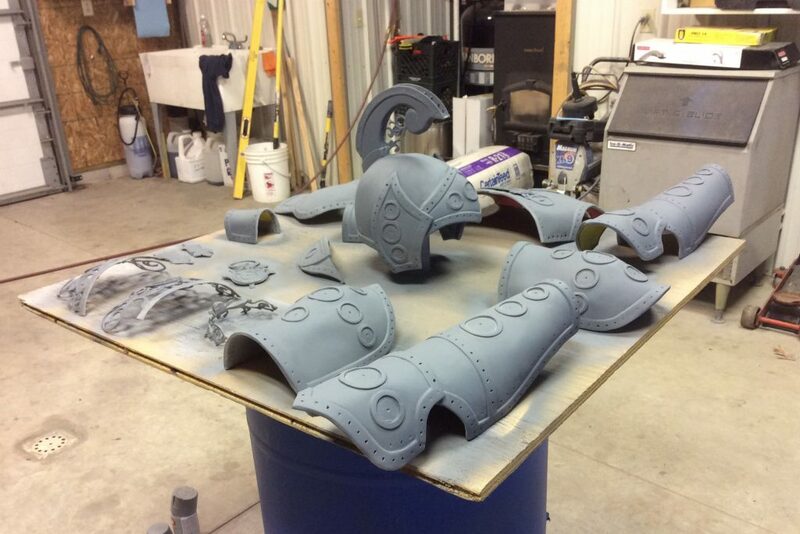 Some metallic spray paints will react badly to clear coats.